Two hours before a fire caused $4 million worth of damage to 28 condos in Coral Springs earlier this year, investigators say one of the residents bought a red plastic five-gallon container at a nearby gas station and filled it at the pump. On Monday, Nathan Counts, 39, pleaded not guilty to an arson charge in federal court in Fort Lauderdale. He has agreed to remain jailed while the case is pending. Prosecutors say the former Ramblewood East condos resident poured the gasoline around the unit, where he had lived for several years with his longtime fiancée, then used a cigarette lighter to ignite the lunchtime blaze. The couple’s three pet cats died in the fire, and dozens of residents were forced to move out of the building, which was damaged by flames, smoke and water. Several witnesses told investigators they heard Counts arguing with his fiancée outside the building and that they heard the woman blaming Counts for the massive fire. Counts initially denied any responsibility but, three days later, authorities said he called law enforcement and left a voicemail admitting that he had bought gas and started the fire in Unit 207. He later gave a full confession with more details, they said. 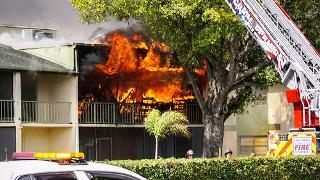 Coral Springs-Parkland firefighters at the scene of a fire at the Ramblewood East apartments in Coral Springs, near Wiles and University Drive. He said he poured gasoline in the middle of the living room, on and under a loveseat and in a bedroom. Then he ignited the fuel. The condo, at 4119 Northwest 88th Avenue, belonged to his fiancée and another man, according to county property records. When Counts’ fiancée came home and discovered the fire, Counts ran out of the condo and locked the door behind him, law enforcement said. Investigators found the five-gallon gas container and a cigarette lighter in the condo where the fire was started. After Counts confessed, authorities also tracked down security video from a gas station, about a three-minute drive from the condo, that showed Counts driving up and buying the container and gasoline just two hours before the fire. If convicted, Count faces between five and 20 years in federal prison. He was initially arrested on multiple state charges, but authorities turned the case over to the feds earlier this month, court records show. He has been jailed since Feb. 27.